This physical asset, was once a blight to our community but opportunity was muffled within its’ peeling walls. Four years later, we see life breathed into places that were once vacant and blighted. Upstairs, the Volunteer Center hosts mission groups that join our community in worship as well as in work. It has also served as a gathering spot for meetings and a starting place for many a lunch tour of our community! On the first floor, Dellz on the Macon is a hot spot for ridiculously good food with a community atmosphere, welcoming “good vibes only”. The student-run businesses, Hodari Screen Printing and Isoke Fine Jewelry, that work out of the Youth Entrepreneurship Center have over seventeen students learning about business cycles while selling their products and making deposits into their Individual Development Accounts that help them save for college. 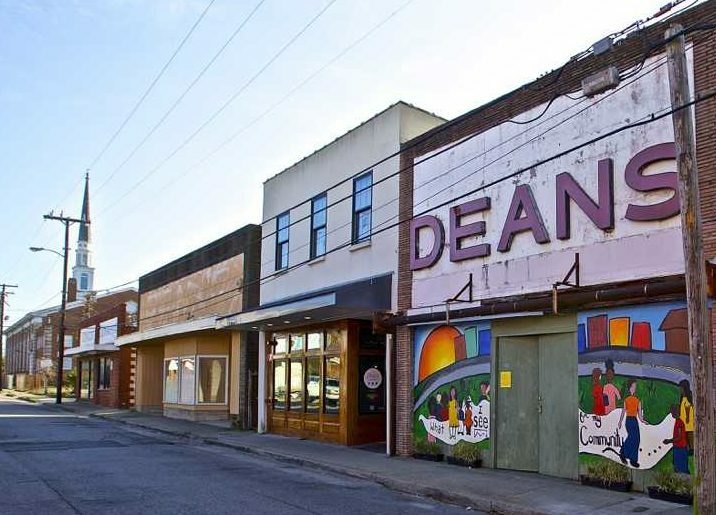 Now, we have similar hopes and dreams for the adjoining old “Dean’s” building. As we seek to restore and revitalize assets, we often find surprises lurking within that must be addressed for transformation to occur. Digging down to stabilize the foundation of the building, we found that our Lowcountry soil required much more work than we anticipated! What began as a fourteen-foot dig to install new stable footings for the building, soon became an additional 140 feet trek down to secure the foundation. That is the size of a fourteen-story skyscraper! However, building good ground and creating opportunity is worth doing right. Whatever form the asset takes, whether physical or human, recognizing the value that it presents at the start makes all the work worthwhile in the end. Soon this building will be home to the expansion of our Youth Entrepreneurship Center and a local business incubator in partnership with Lowcountry Local First. When the internal work gets done, we find we are capable of much more than we ever imagined. That is Metanoia; that is transformation! Now, we anticipate together what the old “Dean’s” building has in store for us as we continue to push forward, creating opportunity and watching what happens when investment meets opportunity.